Every year during the holidays my parents used to get sent an enormous box of pecans from Georgia. For my mother, a major pecan lover, this was as good as the first present a kid opens on Christmas morning. We would all munch straight from the box until Mom stopped us so that she would have enough left over to make pecan pies and her famous holiday cheddar wafers topped with a pecan halve. This Pecan Pie recipe is a variation on my mother's heavenly, caramel-flavored version, but instead of the corn syrup she uses in hers, I use a somewhat brown rice syrup. My pie has the same creamy center as my mom's with a tons of pecan pieces in every bite. But don't just take my word for it, watch Kenya and his friend August make 'em fresh this Friday in the Pecan Pie program. The two of them had the best time pouring, stirring and baking they're own pies....and an even better time gobbling them up! 2. Line a pie dish with pie crust. 3. Place the first 6 ingredients in a bowl and combine. 5. Pour the batter into your crust-lined pie dish. 7. Allow the pie to cool completely and serve. I have never heard of brown rice syrup...can you tell me about it? If it better for you than corn syrup? You can buy brown rice syrup at whole foods and all health food stores. It has a very sticky texture just like corn syrup. Can you use margarine? We are dairy free, so the butter will not work for us. Can Rice Syrup replace corn syrup in any recipe? I bought some to try but have had no idea what to do with it. I would make it using Earth Balance (dairy free and vegan)which is a great substitute to butter and much healthier than margarine! There are TONS of weelicious recipes using brown rice syrup. I would like to say you can sub it for corn syrup, but I like to test each recipe to be sure. I use maple syrup (in place of corn syrup) in my pecan pie and it is incredibly good. I am interested in the brown rice syrup though - anyone know the nutritional and taste differences between this and maple syrup? Maple syrup isn't as sticky as rice syrup. It also has a relatively neutral flavor and taste like corn syrup. I've heard of using maple syrup in place of corn syrup. Do you know about how the pie turns out differently using maple syrup, corn syrup, and brown rice syrup? I feel like you would need less maple syrup because it doesn't have as tacky a texture as rice or corn syrup. Ms. McCord, This recipe is what I've been searching for! I'm stopping everything right now and making it with my kids. Thank you! To make this vegan, do u think it wld taste just as yummy to sub a ground flax/water mixture to bind? Can u use light Brown sugar in place of the dark brown sugar?? Can you use agave instead of brown rice syrup (since I have it in my cupboard)? This sounds terrific. I will make it with a heart-healthy crust made with organic canola oil and half whole wheat pastry flour, half white. Can't wait to taste it! I absolutely love the program on this! So refreshing to see the same \"turkeys\"are in your kitchen as mine. Happy Thanksgiving!! This is in the oven right now. I can't wait to taste it! This was great. It did not affect my father in laws blood sugar to bad and in fact everyone said that is was the perfect sweetness. Can you use almonds instead of pecans? How many inches has the crust to be? You could make this a day before and store it in a loosely covered container on the countertop or in the fridge! If you store it in the fridge, take it out about half an hour before you plan to serve it to allow it to come to room temperature! If I bake two pies in the oven do I need to leave it more time? They will take a bit longer to bake. I would switch them halfway through so they cook more evenly! Bake until they're set! A bit of jiggle in the center is fine because they'll continue to firm up after baking! I was wondering, could you use agave syrup instead of corn syrup? I swap them out all the time. You can find different levels of agave from clear to dark amber. I would use the dark amber to closer resemble the brown rice syrup. My brother made a similar pie, but used maple syrup instead of corn or rice syrup, and boy was it good! And I don't even like pecan pie! Partly because the pecans irritate my tongue, if I eat too many, but also because I never cared for the fillings of the kinds you find in the store or restaurants. I'm thinking I may have to make this and take it over to the in-laws for Thanksgiving this year. Followed this recipe but instead of dark brown sugar I used light brown since that was all I had and even added a handful of chocolate chips to half the of pie. It was delicious all in all! Thanks so much. Check out my blog to read about my adventure making it! Made this today for Thanksgiving-I did use brown rice syrup and followed the recipe exactly, I used Trader Joe's frozen pie crust. My four-year-old helped me make the pie. 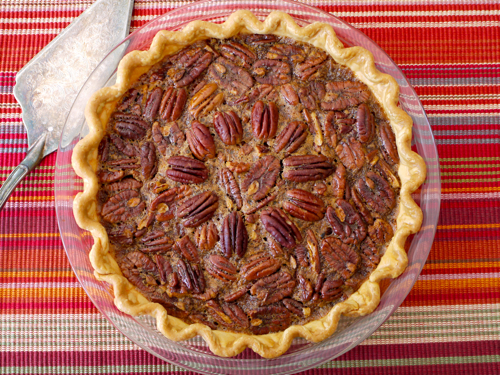 It came out wonderful-My mother-in-law said it was the best pecan pie she ever had. Thank you so much for this awesome recipe, Catherine! Just made this now! We already had pumpkin pie and apple crisp but I just couldn't help myself! I made a Pate Brisee crust (all butter) and cut out little leaves to decorate. So funny because I went to our natural grocery store asking for corn syrup and a few women looked at me in horror! One woman handed me the brown rice syrup and told me to use that or maple syrup instead! I was pleased with the consistency - it's thick like corn syrup. Maybe next time I'll add a bit of maple syrup too. It's cooling now, so tonight or tomorrow we'll try it with my homemade maple vanilla whipped cream. Thanks for the recipe! Looking for variations to every cooking without corn, wheat, and most of the time without regular sugar. This was delicious! I made it for my bday and it was a hit- I'll definitely be making it again!